Budget 2019 delivers the first surplus since 2008, personal tax cuts, cash handouts for energy payments to welfare recipients, and plenty of money for infrastructure projects – mostly from good luck with China and commodities. The foundation of the 2019-20 Budget is a projected surplus of $7.1 billion (0.4 per cent of a total federal budget of around $500 billion). The surplus benefits from a substantial increase in revenue from company tax, based on strong commodity prices, which has more than offset a softer outlook for household consumption, dwelling investment and average wages. 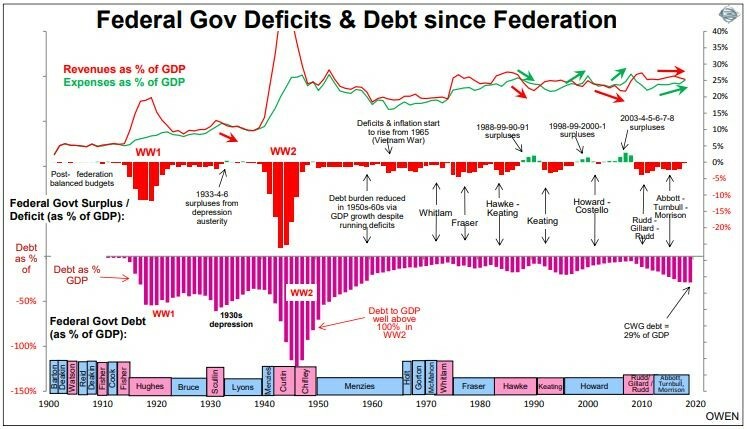 Here is a chart showing the Federal Government’s deficit and debt position since 1901. The upper section shows revenues (green line) and expenses (red). The middle section shows the resultant annual surpluses (green bars – look hard!) or deficits (red bars). The purple bars in the lower section shows the level of Federal Government debt. All are expressed relative to total national output (GDP) each year. GDP – Gross Domestic Product is a monetary measure of the market value of all the final goods and services produced in a period of time, often annually. If the Federal Government achieves a surplus in the current 2018-19 year it will be mainly thanks once again to fortuitous tax revenue gains from the mining boom, not because of cost management. In the past five years the population has grown by just 8%, but government spending has risen by an incredible 21%. By sheer luck the mining boom has increased revenues by 27% but windfall gains like these are not sustainable. The so-called Underlying Cash Balance, which is the measure used for the ‘surplus’, is forecast at $7 billion in 2019/20, the first surplus after a decade of deficits. But it is next year, so it’s not yet ‘delivered’. The Budget is a good reminder of where the revenue comes from, and where the spending goes. Total revenue for 2019-20 is expected to be $514 billion, with total expenses of $501 billion. Income tax relief by taxable income bracket – up to $1,080 for singles and $2,160 for families with 4.5 million Australians getting the full benefit in 2018/9 financial year. 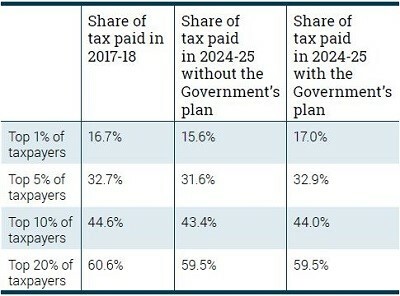 From 1 July 2024, the Government will reduce the 32.5 per cent tax rate to 30 per cent, abolish the 37 per cent tax rate and increase the threshold for the 30 per cent tax rate to $200,000. Treasury estimates these changes will result in 94 per cent of Australian taxpayers facing a marginal tax rate of 30 per cent, which will apply to incomes between $45,001 and $200,000. The threshold for singles will be increased from $21,980 to $22,398. The family threshold will be increased from $37,089 to $37,794. For single seniors and pensioners, the threshold will be increased from $34,758 to $35,418. Expect to see a lot more vans and utes priced just under $30,000, with the instant asset write-off threshold rising to this level from tonight until 30 June 2020 applying on a per asset basis. This has been popular in the past, with more than 350,000 businesses already using it. It has also been expanded to include medium‑sized businesses by increasing the annual turnover threshold from $10 million to $50 million. The Government claims impressive results will be achieved by focussing on tax collection from multinationals and the black economy. The ATO Tax Avoidance Taskforce is estimated to raise a further $4.6 billion in tax liabilities over the next four years. The impact on the black economy is estimated to return an extra $5 billion to the budget. The Budget provides $528 million over the forward estimates for a Royal Commission to examine violence, abuse and exploitation of people with a disability, and $328 million for prevention and frontline services to reduce violence against women and their children. There is $525 million for vocational education and training, with added funding for employers to train apprentices. Defence capabilities will receive a mind-boggling $200 billion over the next decade. Annual funding for schools will grow from $20 billion in 2019 to $32 billion in 2029, while universities will receive $18 billion next year. After the ‘medi-scare’ of the last election, there is a ‘guarantee’ to strengthen Medicare to ensure Australians access timely and affordable healthcare. Mental health care has higher priority and funding. Total funding for aged care will increase from $22 billion next year to $25 billion in 2022/23, including support for in-home services. To further assist the reduction in congestion, the Migration Program will be reduced from 190,000 to 160,000 places for four years from 2019‑20. The Government will also create incentives for migrants to settle in regional centres. The Government claims Australia will overachieve its second Kyoto Protocol target (2013–2020) by 240 million tonnes. To meet emissions reductions under the Paris Agreement, $3.5 billion will be invested in a new Climate Solutions Package, including a $2 billion Climate Solutions Fund. A $79 million investment in energy efficiency measures, including grants to businesses and communities, is expected to deliver 63 million tonnes of emissions reductions. There is funding of $1.4 billion for the Snowy 2.0 project to bring 2000 MW of electricity generation into the system and up to 175 hours of energy storage that can meet the peak demand of up to 500,000 homes. 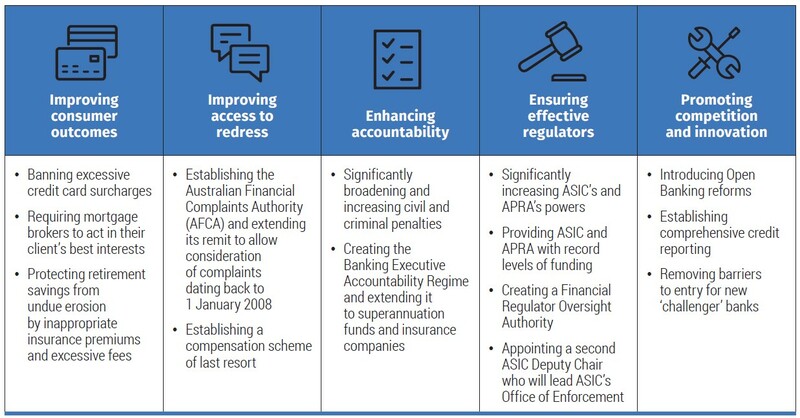 On the Financial Services Royal Commission, the main story is about ‘restoring trust in the financial system’, with the key policies included in this graphic. Under the change, voluntary contributions (both concessional and non-concessional) can be made by those aged 65 and 66 without meeting the work test from 1 July 2020. They can also make up to three years of non-concessional contributions under the bring-forward rule. Those up to and including age 74 will be able to receive spouse contributions. (Our comment: This measure effectively allows clients to make voluntary contributions up to the scheduled Age Pension age of 67, regardless of whether they are working. There is also a delay to 1 October 2019 in the start date for ensuring insurance within superannuation is only offered on an opt-in basis for balances of less than $6,000 and new accounts belonging to members under the age of 25 years. In total, the Government is providing $607 million to facilitate the response to the Financial Services Royal Commission including ‘taking action’ on all 76 recommendations (even if that means not adopting some of them, such as with mortgage brokers). The ATO is expanding the SuperStream Rollover Standard used to transfer information between employers, superannuation funds and the ATO. The start date of SMSFs will be delayed until 31 March 2021 to coincide with the expansion of the overall standard. A previous change due to expire in 2020 is now made permanent to make it easier for super funds to merge. ASIC has been pushing for rationalisation in the industry, so this move makes sense. It ensures members are not adversely affected by taxation consequences (such as realising capital gains) when funds merge. Designed to reduce costs and simplify reporting for super funds, trustees with both accumulation and pension phase assets can choose their preferred method of calculating Exempt Current Pension Income (ECPI). Where the proportionate method is used, with all fund members in retirement phase, no actuarial certificate is required. This is an extract from the Treasurer’s announcement on the Energy Assistance Payment. Before anyone spends it, remember it requires legislation. The payment of $75 for singles and $125 for eligible couples will be exempt from income tax and will be paid automatically before the end of the current financial year, subject to the passage of legislation. The Government is able to deliver this assistance because our responsible budget management allows us to guarantee the essential services Australians rely on. 225,000 veterans and their dependants receiving eligible payments from the Department of Veterans’ Affairs. The Government will provide $36.4 million over five years from 2018-19 to extend Family Tax Benefit eligibility to the families of ABSTUDY (secondary) student recipients who are aged 16 years and over and are required to live away from home to attend school. This will improve access to secondary education for Indigenous Australians and help reduce the gap in outcomes between Indigenous and non-Indigenous Australians in high school completion. The Government will provide $320.0 million for a one-off increase to the basic subsidy for residential aged care recipients. $35.7 million will be provided to increase to the dementia and the veterans’ home care supplements to support home care recipients who require additional care to stay in their homes longer. $7.1 million will be provided over two years to improve payment administration arrangements for home care packages to align home care arrangements with other Government programs, such as the National Disability Insurance Scheme. The Government’s Home Care Packages Program supports Australians who choose to receive care in their own homes. The Government is providing $282.4 million over five years from 2018-19 for an additional 10,000 home care packages across all levels. Australians with dementia or requiring cognition support will benefit from additional funding for home care supplements, and the Government is providing $7.7 million to develop an end-to-end compliance framework for home care. The Government will provide $5.9 billion over two years from 2020-21 to extend the Commonwealth Home Support Programme (CHSP) funding arrangements. The CHSP contributes to essential home support services, such as meals (Meals on Wheels), personal care, nursing, domestic assistance, home maintenance, and community transport, to assist older people to keep living independently in their own home. The Government has announced a National Plan to Respond to the Abuse of Older Australians. The Plan includes $18 million to create a new National Hotline (1800 ELDERHelp or 1800 353 374) and conduct trials of frontline services for victims of abuse. The Government is also contributing $1.5 million towards developing a Serious Incident Response Scheme. The Government is establishing the independent Aged Care Quality and Safety Commission from 1 January 2019. An additional 13,500 residential care places will be available, combined with a $60 million investment in infrastructure. The Government is providing a $320 million general subsidy for residential aged care and $8.4 million will be provided to introduce mandatory reporting against several national residential care quality indicators. Below is a link to the latest TFLG newsletter!